The Parker A-Lok BC-316 series compression tube fitting is made of type 316 stainless steel, and mounts on a wall or bulkhead to connect tubing through a barrier. This coupling is for a fixed connection between tubing made of stainless steel. 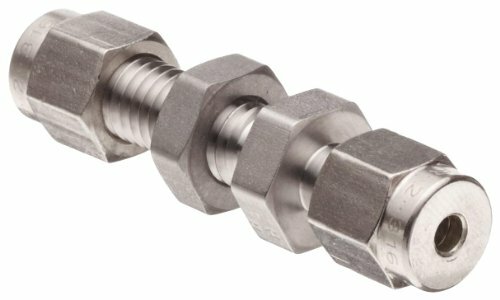 A twin ferrule compression fitting connects to tubing on one end for a leak-resistant seal in high-pressure, high-vacuum, and high-vibration applications. This fitting is made of chemically hardened type 316 stainless steel that provides higher strength and greater corrosion resistance than untreated stainless steel. It is commonly used in chemical, petroleum, power generation, laboratory, and medical device plants.